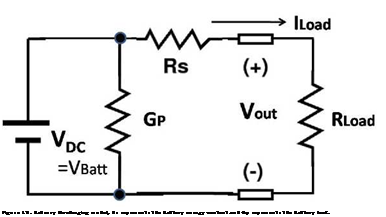 To measure battery source resistance, as shown in Fig. 6(a), a 12-V/75-AH battery supplied the load through a switch. We adjusted theload resisdancrdkL to change the battery discharging current Ib. From the voltage difference Eb – Vo and Ib, the source resistance rb can be determined. Because the solar energs is much smellier than tinea battery energy and the solsr cell internal resistance rp is much la rgecthan thebattery source resistance rb, as shown in Fig. 6(b), the output terminal of the solar panel is directly grounded to measure the solar charging current Ip. A 75- W solar cell panel was used rit tine experiment performed oufooois. From the tolar voltage £p andthe current Ip, the rolartntemel resistance oar be determined. Owing to the large variation in the wind and solar energy, the converter is employed to provide the stable power for normal application. When only one energy source supplies the load, as shown in Fig.1(a), the voltage and frequency of the converter output is adjusted to meet the load specification. In Fig. 1(b), both wind and solar energy supply the same load simultane­ously. In addition to the load requirement, the voltage and frequency of both converter outputs are adjusted such as the two energy sources can supply the load at the same time. In case of the DC-DC converter, only the output voltage of both converters should be adjusted to charge the same load. Discharging process can approximated by using a Constant Voltage Source Circuit Model as illustrated on Fig 19 below. The reason we use Constant Voltage Source circuit model, be­cause there is a fact that at condition of near to empty, the battery (without load) still has voltage that close to peak voltage when battery at the full condition. Based on this fact, it is difficult to use capacitance model for discharging process. At Constant Voltage Source Cir­cuit Model, VDC models Constant Voltage Source of the battery, while Resistance Rs models and represents the battery energy content. Gp represents the battery leak, which is quitely equal to G(V, T,i) function on battery charging model.